Hi, I am interested in your 1965 Shelby Cobra (stock #5078-CHA) listed on Autotrader for $57,995. I'd like to get more information about this vehicle and confirm its availability. 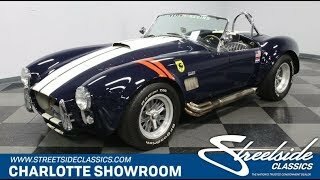 Great colors, a monster big block with dual quads, and a fully independent suspension this 1965 Shelby Cobra ERA has all the features you want in a package ready to dominate the street or track. This is the iconic color combo for Cobra. After all, a deep blue with full length racing stripes is exactly what we picture when thinking about a Cobra on the track. In fact, you get all the right competition-style decals, including the Terlingua Race Team one that Shelby fans love to point out. And its always nice to see brightwork add flair while also adding function in places like the push bumpers, roll hoop, and polished side pipes. Finish it off with Halibrand wheels with knock-off hubs, and Cobra is as race-ready as it looks. Black racing buckets and competition harnesses are exactly what you love to see in a Cobra. When you sit down, you get the full experience. Your left hand will love the correct wood and chrome three-spoke steering wheel with AC center cap. And your right one may never want to leave that well-positioned shifter. The full dash has all the right pieces, from the aircraft inspired clock, to the fire suppression system, to the full package of proper Smiths gauges. Theres even the signature of driver Peter Portante, Jr. across the dash lid. Under the hood, the big block has a dominating presence with those long 427 polished valve covers and double air toppers. After all the 427 side oiler motor is a true racing legend. It inhales deeply with a dual set of Holley four-barrel carburetors. Not only were these recently rebuilt, but also they are specifically designed to sit atop the FoMoCo racing intake. So it fires up nicely while making a thunderous growl out of the header-fed side pipes. A total power package like this requires the best control. Thats why you have a Tremec five-speed manual transmission. Theres also a fully independent suspension that features a strong Jaguar rear end with inboard brakes for better weight distribution. And speaking of the brakes, you also have a superior four-wheel disc setup. Add in the grip of modern BF Goodrich tires, and you soon realize this is a fast machine that also knows how to also handle the corners. Seriously powerful and classically finished, this is a terrific Cobra package thats going to get snatched up soon. Dont miss out, call today!